Well, I’d argue that being happy is essential too, but that one begets the other – a life with purpose and at least partially spent serving others can often lead an individual to be happy. 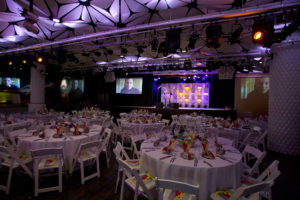 Picture shows the Purpose Awards @thestreamys, LA Live in Downtown Los Angeles. That was certainly the case at The Purpose Awards @TheStreamy’s Sept. 25 at The Conga Room in LA where individuals and organizations making a difference in their communities and positively impacting humankind were honored. By the tables full of smiles and cheerful energy that can’t be contrived, I’d venture to say these people invested in living purposeful lives, are also very happy. The show expands the previous years’ Streamy Awards Social Good category, with six awards honoring companies and brands, creators, influencers, nonprofits and NGOs who use online video and social media to amplify their message, foster engagement and participation, and make a greater, more meaningful impact. 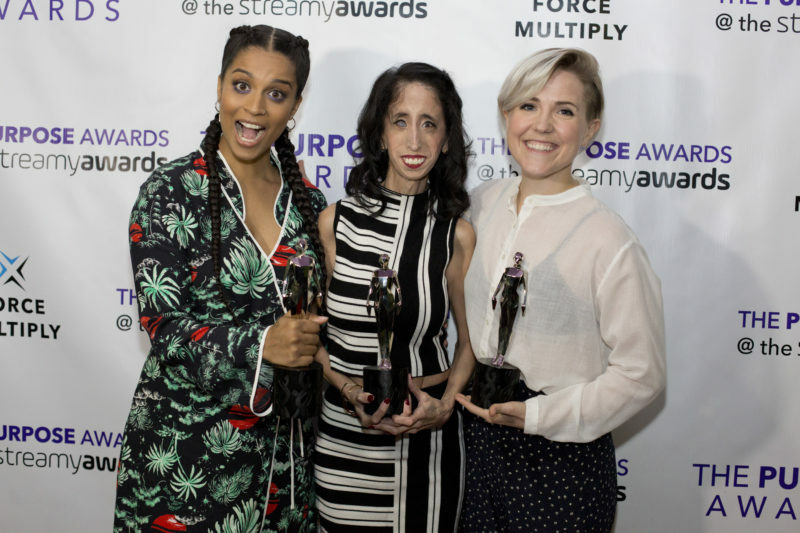 This year’s honorees included Lilly Singh, Lizzie Velásquez and Hannah Hart for the Creator Award, Activision Blizzard, Bank of America and Ford for the Company or Brand Award, Global Citizen, Make-A-Wish and Meals on Wheels for the Non-profit or NGO Award, Karlie Kloss, LOVE ARMY and Omaze for the Uniter Award and the The Ad Council received the Legacy Award. Picture shows Honoree Geena Davis, at the Purpose Awards @thestreamys, LA Live in Downtown Los Angeles. In addition to honoring individuals and organizations for their social impact work, the award show platform was a catalyst to inspire all attendees and fans around the world to embrace social good. Putting purpose into practice, highlights included a focus on gender equality (inspired by The Geena Davis Institute for Gender in Media) and had a female led production team staffed by Backlot Productions and female executive producer in Kim Garner. Jeremy Yun, a 15-year-old high school supremely socially conscious freshman- and a guitarist, songwriter, and co-founder of the band WJM (which has performed V shows such as NBC’s Little Big Shots and the European TV show Super Kids!) was a presenter and pledged $10,000 to the future of The Purpose Awards, to support artists who use their gifts to bring meaning and purpose all year round. 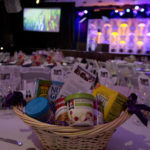 At the event, staffed with volunteers from Belmont University, the founder of The Purpose Awards, Force-Multiply CEO Lou Raiola, made and followed through on a commitment to have the lunch be a zero waste event aided by Zero Waste Co. 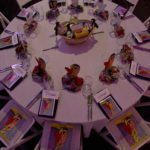 It was straw-free in support of Adrian’s Grenier’s current Lonely Whale initiative @StopSucking, to help drain our oceans of plastic and the non-perishable food baskets that served as centerpieces on each table were donated to the Skid Row Carnival of Love, a day residents of the US’s largest homeless community are treated with humanity and respect thanks to Wayfayer Entertainment (and Jane the Virgin star) Justin Baldoni conceptualizing the idea as a birthday party one year and watching it grow exponentially since. All attendees were asked to bring a used electronic and Homeboy Recycling had bins collecting them to be recycled. Original art for the inaugural event was created by autistic artist Jimmy Reagan, who’s learned to communicate via his art and had his piece “Girl from Italia” on display and adorning the cover of the programs. During the event Ron Finley, aka The Gangsta Gardner, a designer and founder of The Ron Finley Project, an organization “that is dedicated to transforming culture from the ground up,” announced a GoFundMe campaign in support of SEA, a Charter School in Los Angeles that caters to students who struggle academically and have a high-risk of delinquency. 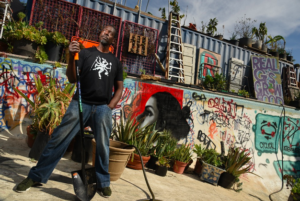 They have big ideas about how young people can change the game and help foster this via things like The Gangsta Gardner’s garden project. The funds raised will go toward SEA’s purposeful curriculum and a garden for the students to nurture and grow, learn responsibility and see the fruits of their labor. You can contribute here. Aiming to be more than one day when individuals and brands are recognized for doing good, the board behind The Purpose Awards aim is to inspire people to live more purposefully each day, spearhead projects to make a positive impact, and regularly recognize those who are positively contributing via thoughtful content.